Do I have to be invited? Freemasons are encouraged to have one aim – that of being happy and sharing that happiness with others. Hungerford Lodge members are doing our best to share our happiness with others. When Mark Wiltshire took over as Master, he made it clear that he was encouraging the Hungerford members to visit other Lodges as often as they could and he is leading by example. This week has very busy for the Hungerford brethren, with members attending Lodge meetings across Berkshire and Gloucestershire. Hungerford member and past master, Greg Hackney, is the current master of the Perseverance Lodge no 4554 invited Mark to join him to see a new mason initiated. 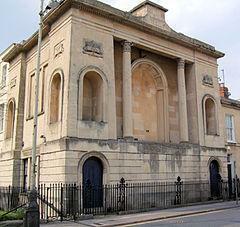 Perseverance Lodge meets in the beautiful Masonic Hall on Portland Street, Cheltenham and was consecrated just two years before Hungerford. Greg (left) is shown with his father, Phillip (centre) also a past master of Hungerford with Mark. Whilst Mark was in Cheltenham, your author was in Sindlesham attending a triple passing (second degree) ceremony at the Greyfriars Lodge no 1101. Greyfriars is a Universities Scheme Lodge attracting candidates from the University of Reading. This was a very well executed ceremony and provided a number of pointers as to how Hungerford could streamline our own double passing scheduled for 21st February. A highlight of the evening for me was standing as a petitioner to ask the Provincial Grand Master of Berkshire to seek permission to establish a new Lodge in Berkshire. Last but not least, Hungerford members visited the Berkshire Country Sports Lodge no 9810 which meets in Wantage. Bob Meikle, one of our Four Aces, was keen to progress through his next ceremony so the Hungerford team asked the Country Sports Lodge to conduct a ceremony on our behalf. There are strong ties between our two Lodges with a number of people being members of both. The Wantage team readily agreed and provided Bob with a night he will never forget. The Hungerford Lodge was well represented at this ceremony with all of the men shown above being members. Bob is shown on the back row of the photo with the glass held highest. Freemasonry is a hobby with an emphasis on being happy and sharing happiness with others. Our member are certainly enjoying their Freemasonry at the moment and seeking to share that enjoyment with as many other Lodges as we can. Perhaps you would like to join us to find out more? Can I visit your Lodge? Can you help my charity? © Hungerford Lodge 4748 and Turning the Key, 2016. Unauthorized use and/or duplication of this material without express and written permission from this blog’s author and/or owner is strictly prohibited. Excerpts and links may be used, provided that full and clear credit is given to Hungerford Lodge 4748 and Turning the Key with appropriate and specific direction to the original content. Hungerford Freemasons A WordPress.com Website.